Jean Ruel, editor and translator. Varii Artis Veterinariae Scriptores Graeci, in Latin. 16th-century manuscript on vellum, written in France by John Helewaert sometime after 1530. Bound in original wooden boards covered with stamped calf. This sumptuous manuscript is a Latin translation of several ancient and Medieval Greek authors on veterinary surgery. Jean Ruel (1474-1537), though a practicing physician, is remembered primarily for his scholarship. Very little is known about most of the authors represented in this text. Ruel's printed edition (Paris, 1530) put many of the authors into circulation for the first time and made them available to an increasingly experimental scientific community. The manuscript is of interest as its exemplar was probably a printed copy of Ruel, though the manuscript is divided into three books, not two as in the printed edition. The manuscript is open to the beginning of the third book. This text should be compared with the Vergil manuscript as two interesting examples produced just before and just after the invention of printing. Although some liturgical manuscripts, like antiphons and graduals, continued to be written well into the 17th century, the production of manuscripts by professional scribes declined sharply in the 16th century, and manuscripts like the two in question represent in some ways the final development of the professional manuscript tradition. 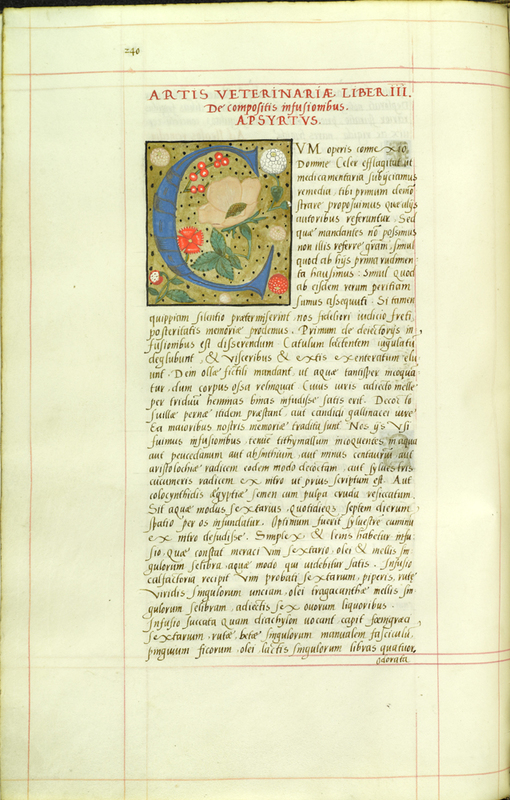 The Vergil, with its inexpensive paper, simple illumination, readily available text, and humanistic miniscule, could have been written at any time in the late 15th or early 16th centuries. The Ruel scribe, on the other hand, curiously transcribed the popular text into a lush volume of vellum folios, ornate illumination, and modified humanistic script. Both are preeminently professional productions, probably written for private buyers of very different means. And although both contained the sort of text that would be disseminated shortly in print, they are good representatives of a fading scribal tradition.